McKenzie County, ND (2,861 sq. 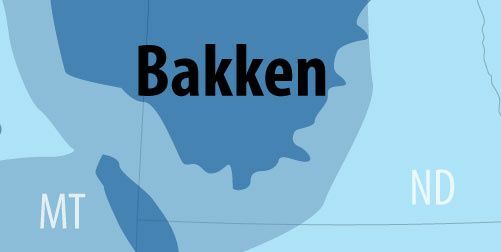 miles) is located in North Dakota and sits atop the Bakken Shale play. It is North Dakota's leading oil producing county, with more than 2,300 currently producing wells on file and the highest number of active oil rigs on a month-to-month basis. McKenzie County recorded its first oil production in the early 1950's, shortly after oil was discovered in the state. Development along the Nesson Anticline in the northeastern part of the county helped establish it as a core producing area for oil production. Shortly after the Bakken boom began, production rose to record levels. The highest total monthly oil production in the county to date was in May, 2014 at 9,685,481 bbls or 312,435 b/d. In November 2015, McKenzie County had 3,354 wells in production and produced 12,562,472 barrels of oil and 22,497,833 MCF of natural gas. During the month, the county produced 35.6 percent of the state’s oil and 45 percent of the state’s natural gas. Since inception, Royalty Clearinghouse has acquired a significant number of interests in properties in McKenzie County. Our team of engineers have years of experience performing thorough economic evaluations of wells operated by some of the top oil and gas operators in McKenzie County including Abraxas Petroleum, Burlington Resources, Continental Resources, EOG, Hess Bakken, Marathon Oil, Petro-Hunt, QEP Energy, SM Energy, Statoil, Whiting Oil and Gas and XTO Energy. By sending your production statements, our engineers can quickly and thoroughly evaluate your interest in McKenzie County. The Bakken formation occupies over 200,000 square miles of the Williston Basin in North Dakota, Montana, Saskatchewan, and Manitoba. Horizontal drilling and hydraulic fracturing technologies have made this a valuable producing formation.